Creeping Jenny is also known as Moneywort. It is a low growing ground cover that will grow to a height of 2" to 4" tall and 1' to 2' wide. 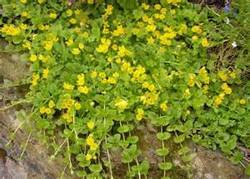 It will produce small yellow flowers in mid spring which attract butterflies. The foliage is a light green and will turn yellow in the fall and remain semi-evergreen in the winter. Plant in partial sun to full shade in moist soil. Use Creeping Jenny as a ground cover, as erosion control on banks, or moist areas near water gardens or along streams, or ponds. It can also be planted to cover or spill over stone walls, boulders. Creeping Jenny is also a great plant to put in hanging baskets or containers as a spiller. This plant also makes a great lawn substitute and will tolerate light to moderate foot traffic. You can also use Creeping Jenny in topiary.